This is the greatest RPG book ever written, in my completely unbiased opinion. It will change the way you look at gaming and at life in general. Everything about it is amazingly amazing. Nab twelve copies today! This book is certainly a joy to read. The book has full color artwork and is hard cover. 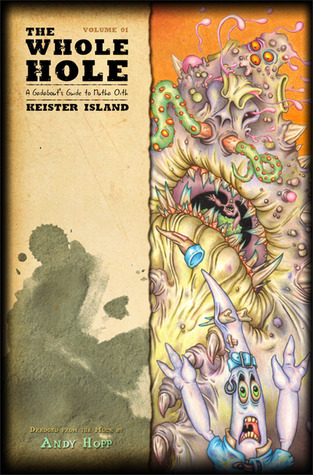 The full color artwork is a lovely improvement over the already incredible artwork present in its sister tome, Low Life It provides an excellent travelogue to Keister Island, and even manages to feature a few new player races, along with an interesting assortment of other creatures. If you have not yet explored the creative brain of Andy Hopp, you are missing out! The world of Mutha Oith is the craziest thing this side of Lovecraft... and every bit of it is wonderfully fun. Sure, it's the basis for a role playing game, but it's really so much more. Andy is a fantastic storyteller and artist, and has created such an incredibly expansive and deep world that it's a great read even if you're not playing a game. Before I can even comment on the content of the book, I have to say that I am amazed by the quality of the book. The Whole Hole: A Gadabout's Guide to Mutha Oith Vol. 1: Keister Island is bound in a beautiful full color and sturdy hardback. The book is 224 pages long and each page is full color which is complimented by being printed on premium high gloss paper. Just by holding and leafing through the book you can feel the high quality of the printing and construction. Plus at $29.95 MSRP? You can't beat that.The second important thing I should mention is the artwork. The art is just out of this world in regards to content, quality, and pure imagination. The artwork just about adorns every single page and each picture is a masterpiece in its own right.And now a quick break down of the contents...Chapter one gives you a break down of the highlights in the wild places of Keister Island. One of the most important thing to remember about Mutha Oith is that it is full of creatures, beings, and to many unknowns to count that just want to eat you or kill in you grotesque and painful way. Some examples of the wilderness hot spots which are described in this chapter are the Soul Patch and Stans Rug.Chapter two provides all the information you could ever want on The Garden of Smellemental Glee. Which is a mix between the Garden of Eden on an Acid trip and a place where all kinds of Smellcasters, monks, and weisenheimers live, breed, worship, practice their variable shades of majic, and occasionally blow stuff up. The Garden is all this and more.Chapter three provides information on the city of Floom. Which is a sprawling metropolis with lots of roads, buildings, poop stacks, and a lot of other things too. This chapter also provides a handy map to Floom.Chapter four provides an detailed overview of the rest of the settlements, cities, etc. that are scattered around Keister Island. Each of these entries describe it, notes of interest, and give ratings regarding how dangerous the place is, the cost of living (cold hard clams), quality of the area, information that it possesses, how much there is to eat, how much there is to drink, and all of that.The rest of the book provides appendixes that deal with new playable PC races, new hindrences and edges, specific setting rules, new equipment, a list of Floom's Guilds of note, the AWESOME bestiary, and of course the glossary, about the author, and the character sheet. I am always a fan of monsters to use, you can never have to many of those and new races were even more amazing. There are the Funguys (which are basically mushroom people), the Flews (which descended from flies but can no longer fly. They are actually very mad about that fact), and the Snells (which are snail like people).Overall the entire book is epic! It is one of the rare RPG books that I have actually read cover to cover. Everything about it inspires the imagination to just run wild with stories, images, character ideas, art ideas, and everything else an inspired imagination can do. Even if you do not play RPG's, this is still an epic book to pick and read for fun or for inspiration or just even for the artwork.Reminder: This is not a stand alone RPG. It requires the Low Life Core book ($29.99 MRSP) and the Savage Worlds Deluxe Edition core book ($9.99). Andy has once again knocked it out of the park! The Whole Hole Vol 1: Keister Island is full of enjoyable, comedic commentary and information about the Low Life world. There is more information in this book than you can possibly use in your gaming lifetime, plenty of wry and comedic commentary, and some of the most detailed and colorful illustrations you could hope for!Just a fun book to read and enjoy, even if you don't play Savage Worlds or other RPGs. Highly recommend!